April 13: The most recent launch from Spaceport America was a rocket developed jointly by students at the New Mexico Institute of Mining and Technology Rocket Team and the Las Cruces company Shite Sands Research and Developers. The rocket reached an altitude of 23,500 feet and a speed of Mach 1.2. March 11: The University of New Mexico is one of nine institutions chosen by NASA to examine pristine Moon samples returned by Apollo astronauts. These samples have been vacuum-sealed and frozen (Apollo 17) or stored in helium (Apollo 15) since 1972 and 1971, respectively. March 2: Exos Aerospace launched a Sarge rocket from Spaceport America. It was the first time it launched a rocket that had flown before. This suborbital flight carried six research payloads. February 22: On it fifth powered test flight, SpaceShipTwo Unity reached an altitude of 56.25 miles with three people aboard. Top speed was Mach 3.04. For previous news postings, visit the News Archives page. Robert Goddard towing one of his rockets to the launch site near Roswell about 1931, courtesy of NASA. WhiteKnightTwo carrying SpaceShipTwo at Spaceport America runway dedication flyover, photo by Loretta Hall. Unless otherwise credited, all material on this site is © Loretta Hall 2010-2019. 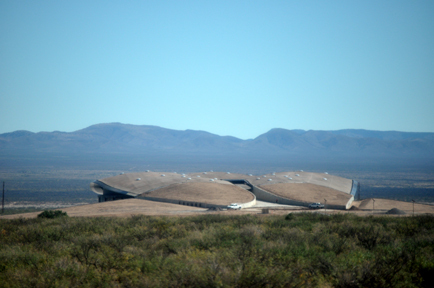 The Virgin Galactic Gateway to Space at Spaceport America, viewed from the northwest. 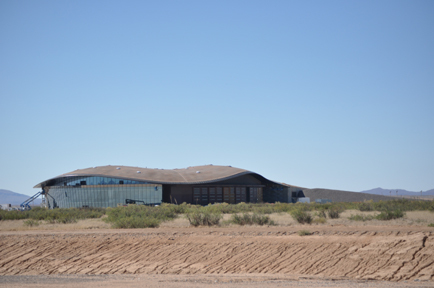 The Virgin Galactic Gateway to Space at Spaceport America, viewed from the northeast.